The Russell Hobbs brand has been synonymous with quality, style and innovation for over 50 years. Founded in 1952 by Bill Russell and Peter Hobbs, the brand has led the way by introducing products that offer real consumer benefits and technological advancements. Such is the strength of the Russell Hobbs brand, it is recognised by 9 out of 10 consumers as a leading small kitchen appliance brand in the UK and has won numerous awards and product accreditations by leading institutes. The Russell Hobbs brand has been synonymous with quality, style and innovation for over 50 years. Founded in 1952 by Bill Russell and Peter Hobbs, the brand has led the way by introducing products that offer real consumer benefits and technological advancements. Such is the strength of the Russell Hobbs brand, it is recognised by 9 out of 10 consumers as a leading small kitchen appliance brand in the UK and has won numerous awards and product accreditations by leading institutes. Russell Hobbs 3 in 1 Panini / Grill & Griddle comes in a classic stainless steel finish. 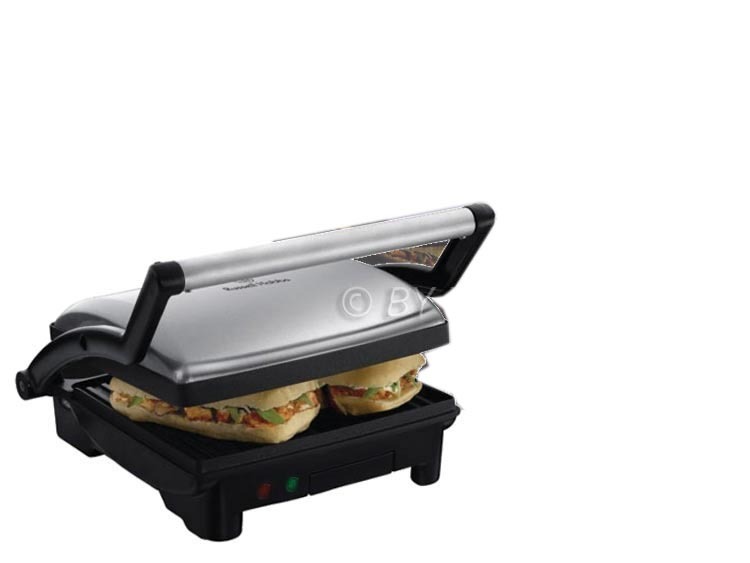 The versatile grill, griddle and Panini maker gives you three ways of heating your food - Panini mode, the non stick plates create 4 rounds of appetising toasted Panini's. A quick adjustment of front feet turns the appliance into the grill mode which allows you to grill 5 chicken breasts. Any fat deposits drip into the integral drip tray providing perfect tasting results. At the touch of a button the plates open up into 180 degrees making it perfect to grill great tasting bacon & veg. The convenient cord wrap makes the Russell Hobbs 3 in 1 Panini / Grill & Griddle perfect for storage.